The Vendor and Supplier Profile Worksheet is used to keep track of vendor and supplier contact information and other details used when interacting with the vendor or supplier. one basic lesson, the big boys like paperwork and they are willing to pay big money when things are presented correctly, they were impressed with the proposals, which in my mind Proposal Kit signed the deal for me! To be very honest, I have never made so much money so easily." This Vendor and Supplier Profile Worksheet is included in editable Word format that can be customized in Word or by using the included Wizard software. Company Name VENDOR / SUPPLIER PROFILE. Vendor Name: Vendor Name. Vendor Address: Vendor Address, Vendor City, Vendor State Vendor ZipCode. Primary Contact: Vendor Contact Name. Primary Phone: Vendor Contact Phone. Additional Contact: Vendor Secondary Contact Name. Additional Phone: Vendor Secondary Contact Phone. Title/Position: Vendor Secondary Contact Title. Billing Contact: Vendor Billing Contact Name. Billing Contact Phone: Vendor Billing Contact Phone. Title/Position: Vendor Billing Contact Title. Email: Vendor Billing Contact Phone. Preferred Payment Method: Check / Credit Card (provided via phone) / ACH Wire Transfer. Bank Routing Number Bank Routing. Account Number: Bank Account Number. 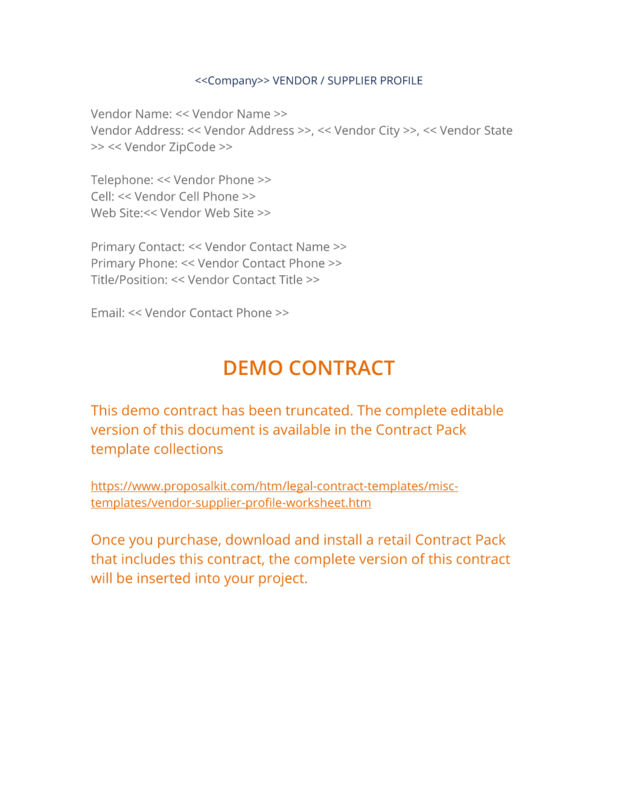 The complete Vendor and Supplier Profile Worksheet - with the actual formatting and layout - is available in this Contract Pack.